My last evening in Australia was spent working an event at the Bundarra Gallery in Port Douglas. One of the most respected galleries in Australia, Bundarra Gallery showcases an extensive collection of contemporary and traditional Aboriginal Art and I was in absolute heaven. 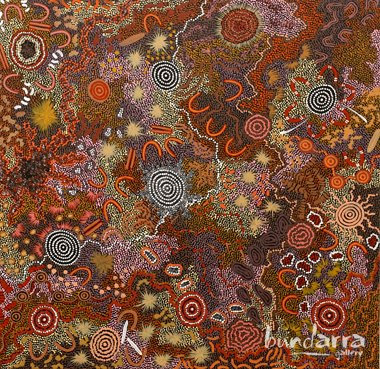 I have always been drawn to the contemporary-esqe, but timeless, representation of abstract dots and swirls in Aboriginal Dreamtime art since that first of what would be many visits to the Australian continent in 1987. There is something in the aboriginal Australian’s artistic expression of creation and ancient storytelling that evokes within me an intensely primal yet profoundly spiritual feeling. When I stare into those intricately painted canvases it is as if I am instantly and emotionally connected to another time and place. 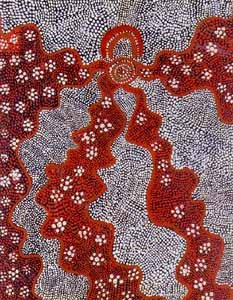 One of the gallery representatives explained that indigenous Australians do not necessarily relate to the concept that art is “something one decides to accomplish” or that one “works with the intention of creating art” or even that someone “becomes an artist” once the appropriate skill has been mastered. They believe that creativity and art are a natural and fundamental expression of the human experience and to separate it as a unique and learned expression is a disservice to the human purpose. Bingo! And this is nothing new - this same concept has been an intricate part of numerous indigenous cosmologies and ancient cultures since the dawn of mankind. There have been many cultures that believe our primary purpose here is, indeed, to create – to give life to beauty. It’s a beautiful thought and I try to image a world where we all walked away from our busy-ness, put down our ipods or our guns and picked up a pen or brush or knife or song or dance or instrument and began to create without thought or purpose – what a world that would be. The indigenous Australians have a vast and unchanging relationship with the land. Its been said that when a traditional Aboriginal person here looks at the landscape, he or she always sees much more than just the physical features. I understand this concept completely and frequently in my travels feel the need to express that same idea as well. Often behind the camera an image I am hoping to capture appears as nothing more than a snapshot - a nearly benign expression of the physical feature without any of the transcendent beauty the place evokes within me. 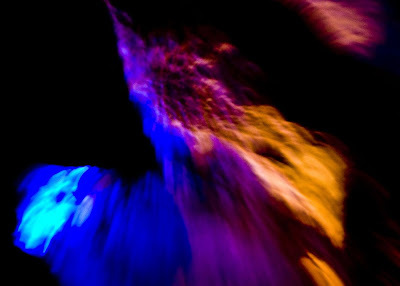 Overtime, I’ve learned how to partner with my camera, my instrument of creativity, to better capture the emotion and spirit of a place through an exaggerated sense of motion and color – much like some of the Aboriginal Dreamtime art tends to do as well. What looks like blurry, out of focus images to many, is indeed, from my point of view, a purposeful representation of the poetry of place as I experienced it firsthand. Case in point: On recent travels in western Oklahoma I made a visit to a popular natural attraction in that part of the state – Alabaster Caverns State Park. 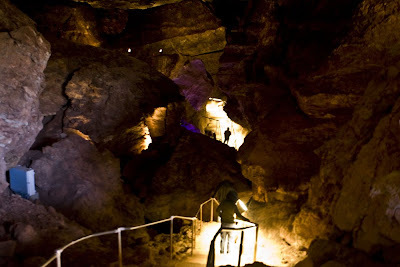 Located near Freedom, Oklahoma, the caverns are home to one of the largest natural gypsum caves in the world. As if the caves themselves weren’t spectacular enough, they are also located at an extraordinary point on the great plains that also features the intersection of two major rivers, an enormous salt pan and a natural hot springs. Native Americans have been using this area for subsistence for thousands of years and archaeologists conclude that this region has been consistently used by humans for more than 14,000 years. In more modern times, various Plains tribes such as the Plains Apache, Comanche, Kiowa, Cheyenne, and Arapaho traversed the area, seeking buffalo, deer, and other game and gathered plants and mined salt. Suffice to say, these caves were not really “discovered” in 1898 and have been an ancient gathering place for indigenous Americans for centuries. Upon descending into the cave one does feel a sort of timeless, mystical, otherwordly vibe. But an ordinary photograph, as seen above, does very little to capture the sort of primal, ancient feeling that moves through these dark rooms. 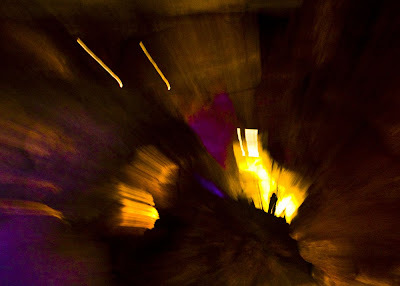 This image is nothing more than a perfunctory snapshot that succeeds in a physical description but fails in its ability to communicate the mood and vortex of energy that were very much a part of the cave experience that day. By the way, that's the Motmot descending those stairs. 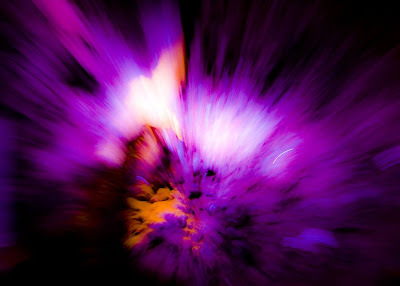 This same image, though, as seen through a sort of "Dreamtime" collaboration between me and the camera does much more to capture the essence of the place, beyond its physical form. On a personal level, this image above is a much truer expression of my cave experience than the snapshot above it and to my mind goes a lot further in illustrating why this extraordinary spot in the world has been a highly revered place of pilgrimage for some 14,000 years now. 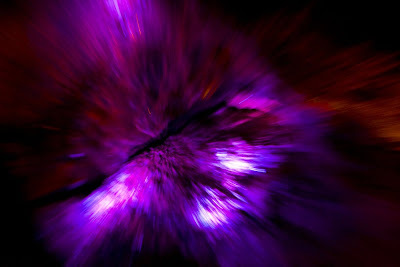 If you've been reading my blog awhile, you're probably now familiar with my occasional use of motion imagery. But it wasn't until 9500 miles away, standing in an Aboriginal art gallery listening to the explanation of the indigenous Australian's use of Dreamtime art to express the energy and emotion beyond the tangible, physicality of their homeland that I finally found the reasoning to explain why these motion shots have always moved me so and are an important part of expressing my travels and journeys. Your dreams are beautiful. May they expand their branches and deepen their roots. Wishing you well from this edge of the dreamscape. I've just gone 'walkabout' while starring at the aboriginal art - The dreams will follow. Sounds like you had an epiphany in the land down under. This is one of my favorite posts of yours, Tim. Yay! Tim, that is so true. Send me some of those dreams to scare away the nightmares! So beautiful, T.R. You writing rivals your photography. I love when you write about our state. I've read so much about the Alabaster caverns over the years - but never had any interest in visiting them until now. Tourism should pay you to blog. This is just incredible. I love the idea of seeing more than the physical landscape, but I'm afraid my mind has been dulled by responsibilities and worries, and I'm not able to see all that is there anymore. I guess we have to retrain our eyes, our souls, huh? Or somehow - find our way to reconnection. Oh, to make the time and energy to discover all that God has for each of us. I'm not sure that I understand everything you wrote but I loved the pictures of the Aboriginal art and your photographs "in dreamtime" of the Alabaster Caverns. I got lost in Grandma's Country for quite awhile. Marvelous personal interpretations. I can see why you so admire this "art," if we may call it that. Being a caver, I can totally apreciate the flatness of photos in a sometimes sureal environment. I like the images in motion. Bingo is right! A profound description of what holds people back and interferes with their creative expression. 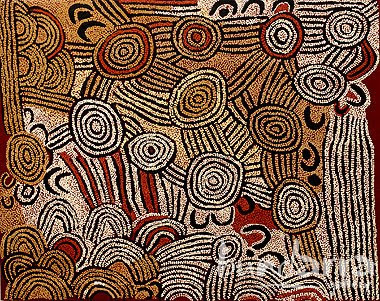 The aboriginal art is incredible. I have always loved native, historic art. I think this is what draws me to gourd art and makes it so nurturing and satisfying to create. Your dreamtime image #1 is my favorite. Hard to explain...but it just pulls me into it. I heard an artist once say that the world will never know it's greatest artist because that person never picked up a brush. Civilized man with his "rules" re what is "fine" art has intimidated many who would have picked up a brush or a piece of charcoal. Beauty is, indeed, in the eyes of the beholder. Thank goodness we all do not have the same favorites. Beautiful art, Tim. All of it. Wow! Stunning pics, T.R. It's been years since I've been to Alabaster Caverns and I've since forgotten those trips. It's good to revisit an old favorite. I like how the Aborigines look at art as a part of human existence and who we are. I think that is a way that I feel, but have never put into words. It is also the way I feel about nature--so much a part of my life, my existence, my being. 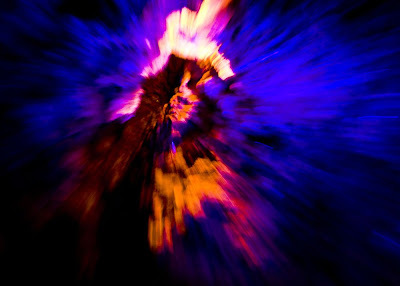 I love your dreamtime shots of the caverns. It makes them look like galaxies. Trying to convey how a place makes you feel is always so difficult, whether using words or images, but places do make me "feel" things, whether good or bad or holy. I believe that many of us who "take" photographs long to "make" pictures, the way we do when painting or drawing. And every once in awhile, we create an image that wasn't actually there, and that someone else with the same camera rig in the same place wouldn't have made. That is such a deeply satisfying thing, but for most of us (me included) it remains an accident. I love the fact that you're consciously making pictures, although I think that the photo of MotMot descending a staircase is incredibly evocative and not to be dismissed as ordinary. I also connect deeply with the notion that, as strangers in another land, we still belong there. I struggle with this every time I visit another country where the language is a struggle, where I know nothing of their culture or mores. I feel clunky and out of place and sheepish most of the time, as if everyone is looking at me, thinking, "Turista!" It is an immense relief to feel as if one belongs in a place, by virtue of appreciating it so much, or of having a real empathy with its inhabitants. When I travel these days, I try very hard to shed that self-consciousness and relax, and realize that I'm the one who generates it, and projects it onto others. Everything goes better when you get out of that self-conscious skin. Having just returned from Honduras with 2,000 photos, I'm looking forward to finding the minor gems among them. Most were taken through a bus windshield; I was worse than any Japanese tourist. But I feel that in snapping everything of the slightest interest, and then having the photos to review, I absorbed much more of the Honduran daily experience than I could have had I just let the images fly by. And my favorites so far are the rawest, clumsiest images, because they tell the best story. I'm still taking pictures, but I'm enjoying the ride. Thanks for this heartfelt and very thought-provoking post from my favorite big-hearted, open-minded student of the extraordinary. The images are wonderful. I love the contrast & the colors. Beautiful post! Your stunning pictures are making me want to take a trip to Alabaster Caverns soon.